Cream the butter until soft, then stir in the lemon zest, juice and cracked black peppercorns. Season with a little salt. Mix well and chill. 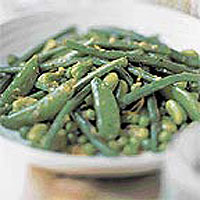 In a large pan, cook the French beans in boiling water for 2 minutes. Add the sugar snaps, petits pois and broad beans, bring back to the boil and cook for 1-2 minutes until all the beans are tender. Drain well. Heat the citrus butter in the pan. Add the drained beans and toss well to coat evenly. Spoon the panaché into a warmed serving bowl.